I hear Message folk mentioning that they have access to the blood through the Word of the Hour. Is this correct? If not, why? 2 What are message believers referring to? 3 Did William Branham add to the Bible? The word “access” is found only three times in the New Testament. (Rom. 5:1–2; Eph. 2:18, Eph. 3:12). These three passages teach us four things about access. We have access into grace (Rom. 5:2) God’s throne is the throne of grace (Heb 4:16). We have access unto the Father (Eph. 2:18). Though He is sovereign, we can still approach Him as a child does a father (Luke 11:11–13, Rom. 8:15). We have access through Jesus Christ (I Tim. 2:5). The blood gives us boldness (Heb. 10:19). We have access by our faith (Rom. 5:2; Eph 3:12). The essential ingredient is prayer (Heb. 10:22). This "access" is available to all Christians. There is NO scriptural support that "access" is available only to people that think William Branham is a prophet. It should also be noted that the blood is not something that we have access to. Rather, the sacrifice of Jesus Christ provides us access to the things mentioned above. What are message believers referring to? When a message believer says that the message gives them access to the blood of Christ, what are they really saying? In him we have redemption through his blood, the forgiveness of sins, in accordance with the riches of God’s grace that he lavished on us. But when Christ came as high priest of the good things that are now already here, he went through the greater and more perfect tabernacle that is not made with human hands, that is to say, is not a part of this creation. He did not enter by means of the blood of goats and calves; but he entered the Most Holy Place once for all by his own blood, thus obtaining eternal redemption. The blood of goats and bulls and the ashes of a heifer sprinkled on those who are ceremonially unclean sanctify them so that they are outwardly clean. How much more, then, will the blood of Christ, who through the eternal Spirit offered himself unblemished to God, cleanse our consciences from acts that lead to death, so that we may serve the living God! Now the main point of what we are saying is this: We do have such a high priest, who sat down at the right hand of the throne of the Majesty in heaven, and who serves in the sanctuary, the true tabernacle set up by the Lord, not by a mere human being. Our High Priest, the Lord Jesus Christ, made his blood available to all believers "once and for all" as indicated above in Hebrews 9. Thus the blood of Christ is available to all believers when they becom... all who trust in Christ for their salvation and not only those that follow the message of William Branham. But God demonstrates his own love for us in this: While we were still sinners, Christ died for us. Since we have now been justified by his blood, how much more shall we be saved from God’s wrath through him! For if, while we were God’s enemies, we were reconciled to him through the death of his Son, how much more, having been reconciled, shall we be saved through his life! It is through the atonement surely, that sinners are brought into a state of reconciliation with God. But this, the Scriptures assure us, is effected by the death or blood of Christ. But now he has reconciled you by Christ’s physical body through death to present you holy in his sight, without blemish and free from accusation — if you continue in your faith, established and firm, and do not move from the hope held out in the gospel. A question that must be asked is this - What is the status of people who claim the cleansing and protection of the blood, but who do not lead the kind of life that entitled them to receive it. Second, the blood of Jesus cleanses us from all sin. If we are not walking in fellowship with our fellow believers, that is evidence that we are not walking in the light. And if we are not walking in the light, again, logically, it follows that we cannot claim the cleansing of the blood of Jesus. So we come to this conclusion: If we are out of fellowship, we are out of the light. And if we are out of the light, the blood no longer cleanses us. 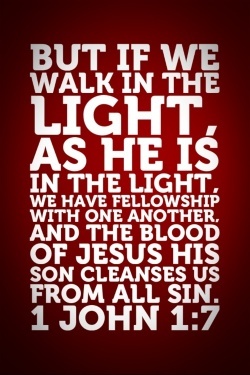 The blood of Jesus cleanses only in the light. Unfortunately, many Christians deceive themselves about their right of access to the blood. They keep quoting the latter part of 1 John 1:7, but in many cases they have never fulfilled the condition preceded by “if ”: walking in the light as He is in the light. Thus, the evidence that we are walking in the light is that we are in fellowship one with another: Out of fellowship, out of the light. Out of the light, no longer under the cleansing of the blood of Jesus. Fellowship is two-directional. First, with God and, second, with our fellow believers. This makes fellowship with God, and with one another, of unique significance in our lives. The closer our fellowship, the brighter the light. As we mature in Christ, we come to a place where there are no longer any shadows, no dark corners, nothing swept under the rug, nothing covered up. That is a very frightening place for the natural man! It is a place of transparency. But that is the only place where the blood of Jesus completely fulfills its function of cleansing. To claim the cleansing of the blood of Jesus without fulfilling these prior conditions is to make the blood cheap, and the blood of Jesus is not cheap. It is the most precious thing in the universe. My dear brother or sister, you have no alternative but to come to the light. What does it mean to come to the light? Confess your sins, first to God and then to any person against whom you have sinned. Bring everything out into the open. Is that a difficult thing for people to do? The answer is yes! The light seems so bright. We tend to recoil from it, saying: I could never bring that terrible thing out into the open—that awful memory, that guilty secret, that enslaving habit—I could not expose it to the light. The natural man shrinks from it. But the wonderful secret is this: When your sin is exposed to the light, the blood of Jesus washes it away and everything is clean. God does not have a bad memory, but He does have a supernatural “eraser” that blots out the memory of sin once it has been forgiven. On the other hand, if you do not bring your sin into the light, your sin remains. Consider once again this tremendous principle: The blood of Jesus cleanses only in the light. Suppose that we have met the conditions: We are walking in the light, and we are in fellowship with our fellow believers. Then we have the right to make this testimony: The blood of Jesus Christ, God’s Son, is cleansing me, now and continually, from all sin. It is very important to see that this is a continuing present tense. The blood cleanses continually as we walk continually in the light. They are two ongoing operations. Continuing to walk in the light, we continue to receive the cleansing of the blood. This is the total cleansing work of the blood. So walking in the light has nothing to do with following William Branham's message but it has everything to do with loving your brothers and sisters in Christ. The sad thing about the message is that it rarely reflects real love. You are accepted and "loved", if you agree with your church and with William Branham. But if you ask questions about the message, then there is no love and only rejection. This is not real love. This is not God's love. If you love those who love you, what credit is that to you? Even sinners love those who love them. And if you do good to those who are good to you, what credit is that to you? Even sinners do that. And if you lend to those from whom you expect repayment, what credit is that to you? Even sinners lend to sinners, expecting to be repaid in full. But love your enemies, do good to them, and lend to them without expecting to get anything back. Then your reward will be great, and you will be children of the Most High, because he is kind to the ungrateful and wicked. 36 Be merciful, just as your Father is merciful. Do message believers exhibit true Christian love? Agape love? Look at how they treat those that disagree with them. Isn't the answer obvious? Did William Branham add to the Bible? And to you man that's listening to this, across the world, wherever you may be. There is something wrong with your experience, when you say that you love God and refuse His Word. There is something. You refuse the very… No wonder the things can't, the church is in its condition, and things cannot be done as God promised, is because you won't even receive the Word or walk in the Light. The Bible said, "Let us walk in the Light, as He is in the Light, then the Blood of Jesus Christ, God's Son, cleanses us from all sin." Sin is "unbelief." Then if we are walking in the God-given Light of the hour, then God takes that Word that's given for the hour and vindicates It. John 1:7 makes no reference to walking in the "light of the hour". Why would William Branham point to himself and make belief in his message be the only thing that fulfills this scripture? How would you know what's right? The manifestation of the spoken Word of God being made manifest, Light of the hour. Certainly. There is what the evidence of the Holy Spirit is, believing the Word of God when It's manifested. He was the Word, manifested. And some of them denied It, laughed at It, made fun of Him and called Him a—a fortuneteller, some evil spirit; there is evidence, speaking in tongues, there is evidence of the fruits. The only evidence there is, is when man believe the written Word. When It's vindicated, walk in the Light of It. Jesus was the Light of the hour because He was the promised Word of the hour, and tried to tell them so, but they were too—too much in darkness to understand It. So is it, today, now. And this is his command: to believe in the name of his Son, Jesus Christ, and to love one another as he commanded us. The one who keeps God’s commands lives in him, and he in them. ↑ Galaxie Software, 10,000 Sermon Illustrations (Biblical Studies Press, 2002). ↑ The New International Version (Grand Rapids, MI: Zondervan, 2011), Ro 5:9. ↑ The New International Version (Grand Rapids, MI: Zondervan, 2011), Eph 1:7–8. ↑ The New International Version (Grand Rapids, MI: Zondervan, 2011), Eph 2:13. ↑ The New International Version (Grand Rapids, MI: Zondervan, 2011), Col 1:19–20. ↑ The New International Version (Grand Rapids, MI: Zondervan, 2011), Heb 9:11–15. ↑ The New International Version (Grand Rapids, MI: Zondervan, 2011), Heb 13:12. ↑ The New International Version (Grand Rapids, MI: Zondervan, 2011), 1 Pe 1:1–2. ↑ The New International Version (Grand Rapids, MI: Zondervan, 2011), Heb 8:1–2. ↑ The New International Version (Grand Rapids, MI: Zondervan, 2011), Ro 4:25. ↑ The New International Version (Grand Rapids, MI: Zondervan, 2011), Ro 5:8–10. ↑ The New International Version (Grand Rapids, MI: Zondervan, 2011), Heb 2:9. ↑ The New International Version (Grand Rapids, MI: Zondervan, 2011), 1 Pe 3:18. ↑ The New International Version (Grand Rapids, MI: Zondervan, 2011), 1 Jn 1:7. ↑ Derek Prince, War in Heaven: God’s Epic Battle with Evil (Grand Rapids, MI: Chosen, 2003). ↑ The New International Version (Grand Rapids, MI: Zondervan, 2011), Lk 6:32–36. ↑ The New International Version (Grand Rapids, MI: Zondervan, 2011), 1 Jn 3:23–24. This page was last edited on 17 July 2017, at 01:26.